A search engine optimisation (SEO) campaign should be elegantly put together to enhance a website, allowing it to naturally rank well. We believe every website should be built in the most clear and user-friendly way, naturally allowing each of our websites to be search engine friendly and readable by all of the search engines, and not just Google. As we wait for search engines to reward our work, a dedicated SEO campaign can take a little more time than a paid advertising campaign, such as Google AdWords PPC. We firmly believe that SEO and PPC should work hand-in-hand together to feed success to each marketing channel, while standing alone to demonstrate their own traffic achievements. Before we commence any of our search engine optimisation campaigns we firmly believe in helping to identify what the markers of success are to your business. By identifying the key business objectives, we then work to tailor the marketing methods that we put in place for your business. This means that you can feel confident that SEO is at the core of the website, from the navigation through to the layout of the page structure and the content. As we wait for search engines to reward our work, a dedicated SEO campaign can take a little more time than a paid advertising campaign, such as Google AdWords PPC. SEO campaigns can be taken one step further through content generation, generally in the form of blogs. These are written according to a well thought out and researched keyword strategy. You can take ownership of writing these blogs on a regular basis or simply use our copywriting service. We firmly believe that SEO and PPC should work hand-in-hand together to feed success to each marketing channel, while standing alone to demonstrate their own traffic achievements. This integrated approach helps ensure that you reach your target audiences. Letting data be the driver when it comes to success, we offer complete transparency in everything that we do, offering regular reports and reviews, and we always welcome our clients to come in for a cup of tea and a chat through the work to make sure you always know what’s happening when and why. Offering a range of services allows our clients to pick a flexible campaign that best suits their marketing needs, whether it be consultancy at the start of a website design project or through an on-going campaign. We adapt to your needs and can grow the campaign alongside your business. Ask us for a free SEO review of your website today. 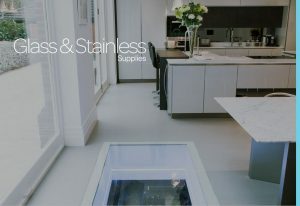 Glass and Stainless are leading suppliers of glass and steel products for both commercial and residential customers. Prior to their new e-commerce site going live, Ultimate developed a comprehensive strategy to kick-start their online presence, which involved SEO, PPC, Facebook and remarketing campaigns.